Think That 12 Inch Subwoofer Is Badass? Try 6 Feet On For Size! | OhGizmo! Think That 12 Inch Subwoofer Is Badass? Try 6 Feet On For Size! Let’s get the sad part out of the way from the start: you can’t buy this monstrosity. 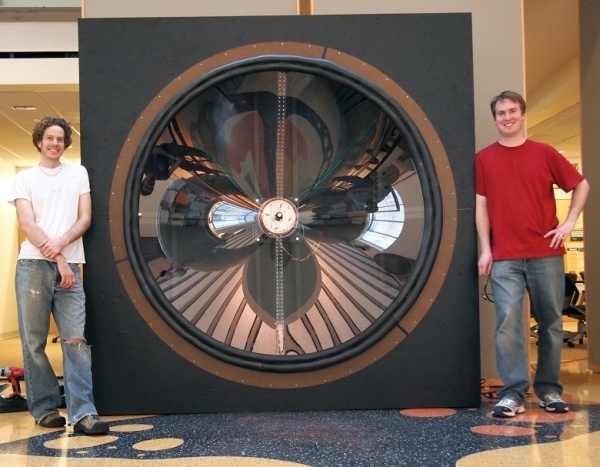 But it’s nice to know that in the spring of 2011, with a bit of elbow grease and a $600 budget, some engineering students from the University Of Wisconsin were able to create a subwoofer with a cone 6 feet in diameter. It was simply called The Giant Speaker. Seeing as this was done on a shoestring budget, the best materials for the job couldn’t be selected. The driver was made of fiberglass, instead of the preferable carbon fiber for instance. Still, the team used 24 Neodymium magnets to drive this giant cone with the voice coil driver being fabricated by hand with three layers of 18awg wire wound onto G10 form attached to a fiberglass disk for support. The giant speaker was then placed in an 8′ by 8′ by 2′ cabinet and set in motion by a “20kW PWM voltage sourced inverter (intended for motor drives and microgrids) which was powered by a 400V DC power supply. At low frequencies (~10 Hz) peak coil currents were 100A.” Turn out it was able to run at frequencies between 5Hz and 50Hz, after which the inertia just became too much for the system to handle. In tests, the group found out that the resonant frequency of the building they were in was 7Hz, which resulted in several complaints from the other tenants and lots of high-fives from the students. No word on whether they found the Brown Note. Great scott! It’s Doc Brown’s amplifier!